stabilizer and fabric fuzzies often associated with machine work. organdy inserts a perfect project for all skill levels. the cautious depart full of ideas for future projects. * Knowledge of basic garment construction required for at home completion. 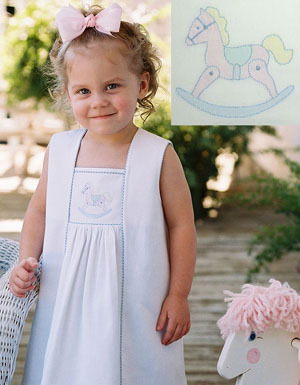 horse motif using a straight stitch, and add hand details. embroidery unit to recreate the look of handwork. needle or template to turn under raw edges. will appreciate the modified dolman sleeves which look like traditional puff sleeves when worn, but greatly simplify construction and extend garment wear. Join Debbie for 4 days of machine magic and learn some of her unique techniques for recreating handwork by machine. well as the incorporation of the new techniques into future projects. 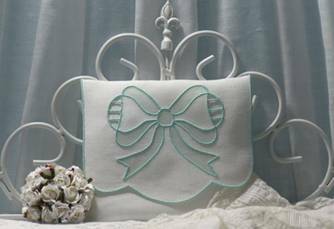 *Prior satin stitch work very helpful. Instructor recommends all students review appliqué pivot positions. and care were woven into the construction of a young lady’s wardrobe. everything is sprinkled with delicate floral hand embroidery. the perfect place to store a tiny Easter egg.